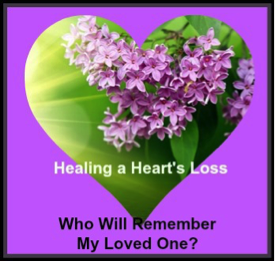 Healing a Hearts Loss » Who Will Remember My Loved One? One comment that is expressed often after a loved one dies is, “Who will remember him/her/they now that they are gone”? The individual is important to you, but you have no idea who else will remember and how or when this will happen. I read a memorial article in the paper for a young girl who died nine years ago and part of the remembering comment stated, “You dance inside our hearts where no one sees you, but we do”. How often have any of us seen such posts and glanced by them with little or no thought? The answer is often, unless this loss affects or resonates with you. I wonder if sometimes it causes us to think of our own loved ones who have died or perhaps that is all done and gone; for some who shut the door fast and tight in case it opens a crack and they “feel” something. The reality is someone does “feel” something and wants others to feel the remembering also. To be touched in some way by this special person’s presence on this earth. I mentioned this to someone recently and the individual stated they remember to this day a friend who died in high school. The remembrance of this friend has been for several decades, but has never been shared with others. Hmmm, someone does remember and the family does not know this. Another shared story was of a class mate who died in grade school and has never been forgotten by his friend to this day. How many people have a memory pass through their mind of someone they knew who has died and never tell anyone else? Who would you share this with? Would the family member be interested in knowing that someone does remember their loved one? In many cases the answer is yes, the family member wants to know more about their person. Imagine for a moment the loved one receiving a short note saying you never forgot their special person. Would there be tears, sadness, joy or perhaps a silent nod with a blessing or a thank you? Maybe, there is an invite to come and spend some time and chat more about this special person in both of your lives. I have noticed that after a death, the people who remain crave any news about their loved one; the good they did in the community and the people they helped. I do not have the answers for them, but what if you were the one to say, “I remember”?